greatest trials in its history. There were thousands of deaths in the wake of that tragedy -- and thousands of heroes. Led by Police Commissioner Bernard B. Kerik and Fire Commissioner Thomas Von Essen, the New York Police Department (NYPD) and the New York Fire Department (FDNY) banded together in courage and hope during the rescue and recovery effort. In the Line of Duty salutes the brave men and women of those two departments, who proved to the nation and the world the strength and heroism of the American people. 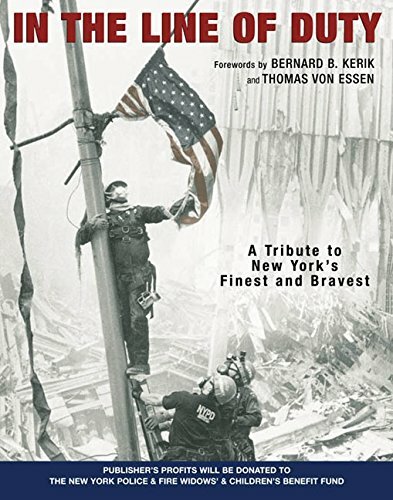 Through over 100 pages of black and white photographs (and 16 pages of full colour), this memorial volume documents the heroism of New York's Finest and Bravest in the hours and days following the disaster. With a Foreword in tribute to the search and rescue teams -- and their fallen comrades -- by Commissioner Kerik, and filled with the inspirational words of national and spiritual leaders, In the Line of Duty bears witness to the indomitable spirit of the American people.